Juventus have confirmed their squad to face Genoa this weekend, and Cristiano Ronaldo hasn’t been called up by Massimiliano Allegri. The 34-year-old has been in stunning form again this season, scoring 24 goals and providing 12 assists in 36 appearances for the Turin giants across all competitions. His heroics in midweek ensured that Juve advanced to the quarter-finals of the Champions League, as he bagged a hat-trick against Atletico Madrid to turn their tie on its head with the Italian giants advancing 3-2 on aggregate. However, as noted below, the Portuguese superstar will play no part against Genoa on Sunday afternoon, as he hasn’t been called up to the squad by Allegri. The Italian tactician was unsurprisingly asked about Ronaldo’s absence at his press conference on Saturday, and he insisted that he was merely resting his talisman given how much he has played so far this season. 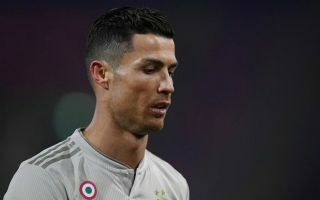 This comes despite the fact that the international break follows this weekend’s fixtures, with Sky Sports noting that Ronaldo has been recalled to the Portugal squad for the Euro 2020 qualifiers. Nevertheless, given there is still a break of sort to follow Sunday’s encounter with Genoa, it seems surprising that Juventus would take the risk of leaving Ronaldo out. On the other hand, they do boast an 18-point lead at the top of the Serie A table having won 24 of their 27 games so far this season, and Allegri can call upon plenty of other quality options including the likes of Paulo Dybala and Mario Mandzukic. In turn, perhaps it’s the timing of the decision to rest Ronaldo which is the surprising factor, as it comes after the Atleti game rather than before. The former Real Madrid superstar will undoubtedly hope to return from the international break with no knocks to continue to lead Juve’s charge for major honours.